This bed has simple lines and details that are subtle and careful not to overpower the personality of a room. A superior bed for the casual lifestyle of kids. 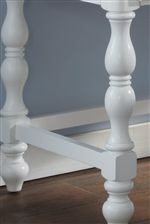 Built with a durable Cottage white finish this bed is refreshing and cheerful like the great outdoors in summertime. A slat roll eliminates the need for a box spring and adjustable bed rail locking positions accommodate optional under bed storage. Simply versatile this bed will please either boy or girl. A bed like this is also inviting as a guest retreat.This bed is available in twin and full sizes. The SummerTime Youth White Twin Poster Bed by Samuel Lawrence at Carolina Direct in the Greenville, Spartanburg, Anderson, Upstate, Simpsonville, Clemson, SC area. Product availability may vary. Contact us for the most current availability on this product. 8466-401 Bed Rails 3/3-4/6 1 76" 1" 5"
8466-631 Poster Footboard 3/3 (w/slats) 1 42" 3" 33"
8466-630 Poster Headboard 3/3 1 58" 3" 55"
The Summertime collection is durable, welcoming, and remarkable versatile. This collection of bedroom pieces are easy to mix and match to get just what you and your kid need. A durable bright white finish on all the pieces is kid-friendly and feels refreshing and lively. With three popular styles of beds, there is a remarkable sleep solution to fit your space and style. Multiple storage options are available including under bed storage. Each piece has design elements with subtle planking and soft curves to establish a cheerful and cozy room. This casual collection is style worthy and practical for sleepovers or an inviting guest retreat. Quality construction ensures complete satisfaction with extra measures for kid safety and durability. The SummerTime Youth collection is a great option if you are looking for Casual furniture in the Greenville, Spartanburg, Anderson, Upstate, Simpsonville, Clemson, SC area. Browse other items in the SummerTime Youth collection from Carolina Direct in the Greenville, Spartanburg, Anderson, Upstate, Simpsonville, Clemson, SC area.